A pioneer for women’s education and liberal arts education in the United States, Matthew Vassar founded Vassar College in 1861. Opening its doors to its first class of 353 students paying $350 for tuition and “residence” on September 26, 1865, the college offered young women a liberal arts education equal to that of the best men’s colleges of the day. Coeducational since 1969, Vassar College set the standard for higher education for women for more than 100 years and now sets the standard for true coeducation. Recognized as one of the best liberal arts colleges in the country, Vassar has successfully fulfilled its founder’s goals. An English-born brewer and businessman, Matthew Vassar established his college in Poughkeepsie, New York, a small city on the Hudson River, 75 miles north of New York City. Soon after opening its doors, Vassar gained a reputation for intellectual rigor that led to the founding of the first chapter of Phi Beta Kappa at a women’s college. For the first time, women were offered courses in art history, physical education, geology, astronomy, music, mathematics, and chemistry, taught by the leading scholars of the day. From the beginning, the Vassar curriculum was characterized by boldness, breadth, and flexibility, and Vassar graduates were recognized as a “breed apart” for their independence of thought and their inclination to “go to the source” in search of answers. The Vassar approach to learning was shaped by faculty members such as noted astronomer Maria Mitchell, the first woman to be elected to the American Academy of Arts and Sciences, and Frederick Louis Ritter, one of America’s first historians of music. In 1869, Maria Mitchell took her students to Iowa to observe an eclipse of the sun, and in the 1880s Lucy Maynard Salmon, professor of history, explored the “seminar method” of teaching through original source materials. Vassar continues to use original source materials as essential teaching elements in several departments. The rare book collection includes books important in women’s history, first editions of English and American literary and historical works, examples of fine printing, courtesy and cookbooks, children’s books, and rare maps and atlases. The manuscript collection features holdings ranging from medieval illuminated manuscripts to modern manuscripts of literary and historical importance. There are numerous collections of Vassar College graduates and faculty. The Virginia B. Smith Manuscript Collection includes manuscripts by and about women, which were gathered during President Smith’s tenure, such as the papers of Mary McCarthy and Elizabeth Bishop. Also of note are papers of writers Samuel L. Clemens and Edna St. Vincent Millay, early naturalist John Burroughs, historian Lucy Maynard Salmon, feminist and historian Alma Lutz, astronomer Maria Mitchell, anthropologist Ruth Benedict and physicist Albert Einstein. The Vassar College Archives document the history of the college from its founding in 1861 to the present and include publications, administrative records, architectural drawings, audiovisual collections, and artifacts. Education at Vassar was also shaped by the study of art. When creating his college, Matthew Vassar stated that art should stand “boldly forth as an educational force.” To fulfill this mission, Vassar was the first college in the country to include a museum and teaching collection among its facilities. 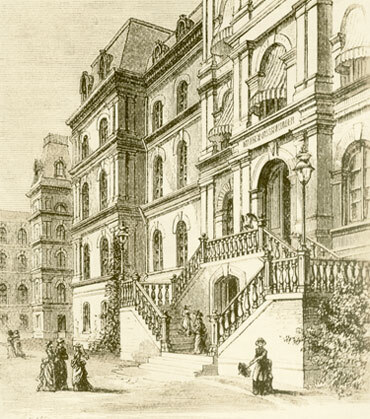 The college’s gallery predates such institutions as the Metropolitan Museum of Art, which was founded in 1870, and the Museum of Fine Arts, Boston, established in 1870. The college’s Frances Lehman Loeb Art Center, with over 19,000 works in its collection, stands as a contemporary acknowledgment of that early commitment. Today, the Vassar curriculum is broader, richer, and more varied than ever with concentrations ranging from Latin to cognitive science, from biochemistry to religion, from astronomy to Africana studies. Vassar, among the first to offer courses in drama, psychology, and Russian, has experimented with interdepartmental courses since the early 1900s and has long been recognized for curricular innovation. After declining an invitation to merge with Yale, Vassar decided to open its doors to men in 1969. In keeping with its pioneering spirit, Vassar was the first all-women’s college in the country to become coeducational: men now represent 45 percent of the student body of 2,450. The unique traditions upon which the college was founded continue to be upheld today: a determination to excel, a willingness to experiment, a dedication to the values of the liberal arts and sciences, a commitment to the advancement of equality between the sexes, and the development of leadership. Vassar continues to stand at the forefront of liberal arts institutions and has positioned itself as a leading force in higher education in the 21st century. The original entrance to Main Building.